Have you ever wanted to grow juicy cherries in your garden, but just don't have the space? 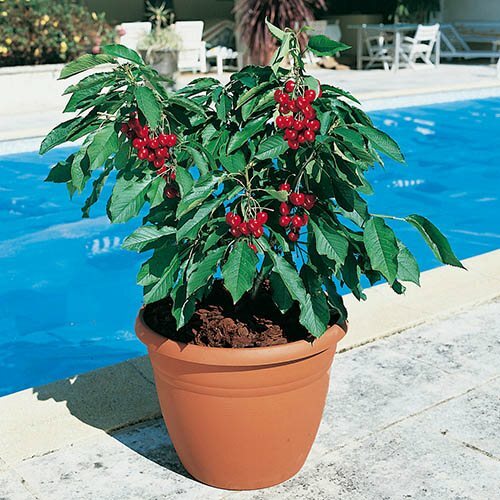 Well now you can - with our perfect for patios Cherry 'Garden Bing' tree! The beauty of 'Garden Bing' is it's petite size - after 5 years or so it will still be about 1M tall. You get an absolutely amazing spring blossom display too - a cloud of pure white flowers in April. Have you ever wanted to grow juicy cherries in your garden, but just don't have the space? Well now you can - with our perfect for patios Cherry 'Garden Bing' tree. Cherry 'Garden Bing' was specially bred by the Zaiger family in America - probably the world's largest fruit tree breeders. The commercial variety 'Bing' Is one of the staples of the fresh cherry industry, and through breeding work they have created a very dwarf variety, still with the taste and yield of it's parents. The beauty of 'Garden Bing' is it's petite size - after 5 years or so it will still be about 1M tall.. They produce a very well-branched tree structure, so bear a lot of sweet cherries that are easy to pick and enjoy. And on top of this, you get an absolutely amazing spring blossom display too - a cloud of pure white flowers in April. These are self-fertile, so will pollinate each other, and produce deep red fruit to pick in August. The perfect fresh cherries fresh in your garden - much easier than you think. Supplied as a 2 year old dwarf patio tree on ultra-dwarfing rootstock, height 60-70cm at delivery, with many branches. Will flower and fruit in first season.